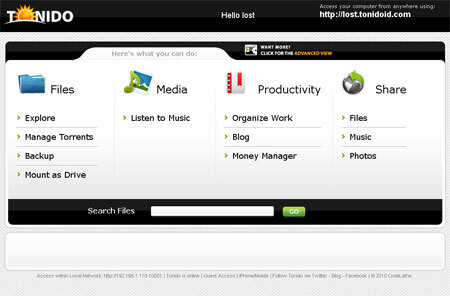 Tonido is a Free Personal Web Application Server. This Intuitive Tool enables you to access and share your locally stored content directly through a web browser. It’s your own portable server for sharing files and photos and more. For example, Tonido can be used to host your own blog, share torrents, host photo albums, listen to music or Mp3’s from anywhere, backup files from one PC to another, etc. Tonido works by assigning a unique URL to each account. This URL can be used to share whatever files, images, or content you choose to publish with others. Access your computer from anywhere!